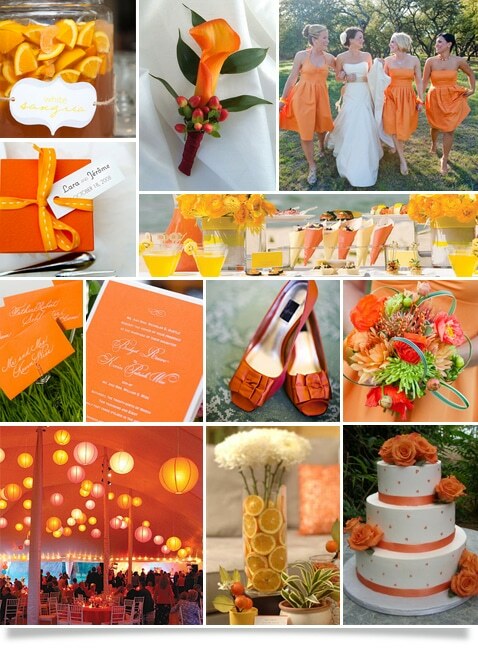 If you are looking for a color that can add flair to your wedding, take a look at orange. 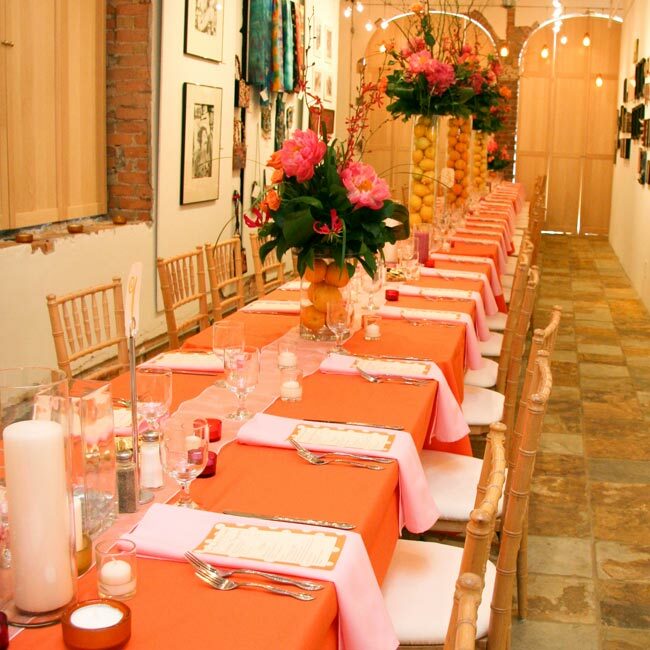 Either on its own, or in conjunction with an other color, orange can be a really terrific wedding color. This is a look at some ways to use orange wedding decorations for every season. When you think of spring, your mind probably goes to pastels. But there is nothing to say that a spring wedding cannot be designed with brighter colors. A pop of bright orange would look fantastic when paired with a pale blue. The look is fresh, current, and distinctive. A great way to combine the two colors is with a signature pattern that is used throughout the wedding. An orange, pale blue, and white stripe would look wonderful for table linens. Or you could go more formal with a large brocade motif designed in your wedding colors. This would be stunning for the invitations and the wedding cake. Orange is a great color for summer, as it is cheery and fun. In this season, it needs no softer color to tone it down. Bright orange gerbera daisies would make for centerpieces as carefree as a summer afternoon. Real oranges can be used as decorative accents. 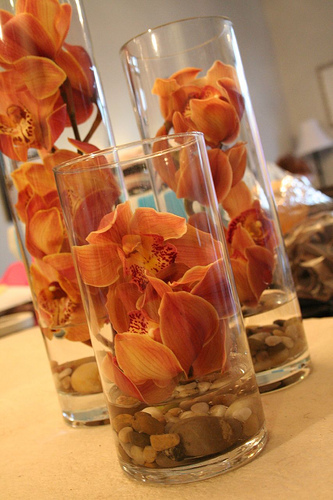 Fill the vase for the centerpieces with bright oranges for a fun and interesting design. If you are working with oranges, think about including their white flowers into your bouquet. Orange blossoms represent fertility, and are one of the most traditional wedding flowers. Orange can be a fun and fresh color for summer bridesmaid dresses as well. Crisp cotton strapless dresses in a cream and orange print will look as summery as a creamsicle. Finish off the look with bridesmaid jewelry gifts created from orange Swarovski crystals and cream pearls. The biggest trend in bridesmaid jewelry right now is clustered gems, which make fabulous gifts that your friends will surely adore. There are so many ways to design an autumn wedding using orange that it might be hard to choose. Think of the crisp fall leaves, the fall pumpkins, pots of orange mums and more. Orange in combination with shades of autumnal gold and russet will create a homey and inviting atmosphere for your guests. It can be used in a rustic style, or a burnt orange can be paired with deep espresso and metallic bronze accents for a rich and sophisticated effect. Even winter brides can use orange decorations for their weddings. Orange and terra cotta roses with hypericum berries is a beautiful way to use this color family. Other ideas for orange winter weddings include mini mango calla lilies, orange orchids, and orange tulips. These flowers will brighten a drab winter's day and add style and sophistication to your wedding. It makes a nice departure from the typical red winter wedding floral palette, especially if you are trying to avoid a Christmasy look for your décor. So you see, orange is actually a very versatile color. It is bold and unexpected, which adds to its appeal when you are creating a unique and personal wedding design. Once you start looking at all of the ways in which orange can be used to make a wedding feel fun and festive, you might just decide that it is the perfect color for your own wedding.